This is part of our Wolf Creek Files blog series. Each post explains, in detail, the context behind an email or string of emails: who is writing, what is being discussed, and why it concerns us. Click here to see previous exhibits. 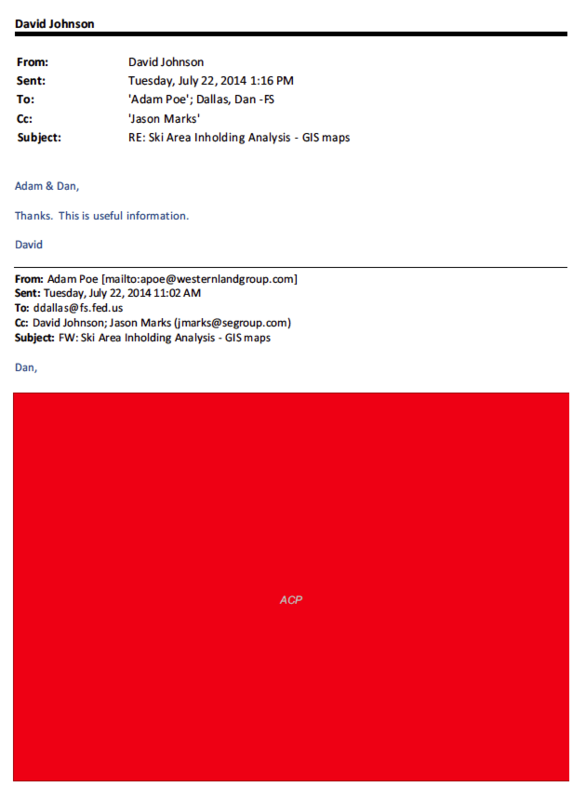 This email from Adam Poe to Forest Supervisor Dan Dallas has been almost fully redacted. When a Freedom of Information Act (FOIA) request is filed the agency is allowed to blackout, or redact, certain legal information conveyed to or from an attorney. **. This practice is called attorney-client privilege (ACP). However, there were no attorneys included in this particular redacted email. Further, Adam Poe is not within the group of Forest Service employees who would be covered by the attorney-client privilege. The information contained in this email should have been disclosed to the public and not redacted. See full email chain here. Many of the documents we’ve received through FOIA and as a result of our legal cases have large sections, even whole email chains, blacked-out due to attorney-client privilege. We are concerned, and evidence indicates (see WCF Exhibit 2), that attorney-client privilege was abused in these FOIA documents to hide damaging evidence. * When the Forest Service considers a change to Forest Service land that would potentially negatively impact the environment they are required to do an Environmental Impact Statement (EIS). ** Freedom of Information Act (FOIA) requests can be filed by the public (anyone) to obtain records (emails, reports, phone records, etc.) relevant to how a public agency came to a certain decision. The law’s intent is to create transparency regarding how the government is acting on the public’s behalf.